You, Me and Movies: Review: "Win It All" is a poor man's "The Gambler"
Review: "Win It All" is a poor man's "The Gambler"
Does anybody remember "The Gambler?" It came out back in 2014? It starred Mark Wahlberg, Brie Larson and John Goodman? I liked the film quite a bit, and I reviewed it for the site. I don't remember it being one of the big movies people talked about at the end of the year, but it was a film that certainly worked for me and one I plan on owning some day down the road. I bring up "The Gambler" because while watching "Win It All" last night on Netflix, I couldn't whether I was watching "The Gambler" or if I was actually watching "Win It All." I spent most of the film's running time trying to figure out which film it was I watching, and that can create an identity crisis for the film. Sure, we are living in the age of homage. Yes, there are several movies made year after year that look the same, sound the same, act the same, but looking at "Win It All" it feels like a remake. In a world where we are getting too many remakes way too soon, it feels like a serious problem. 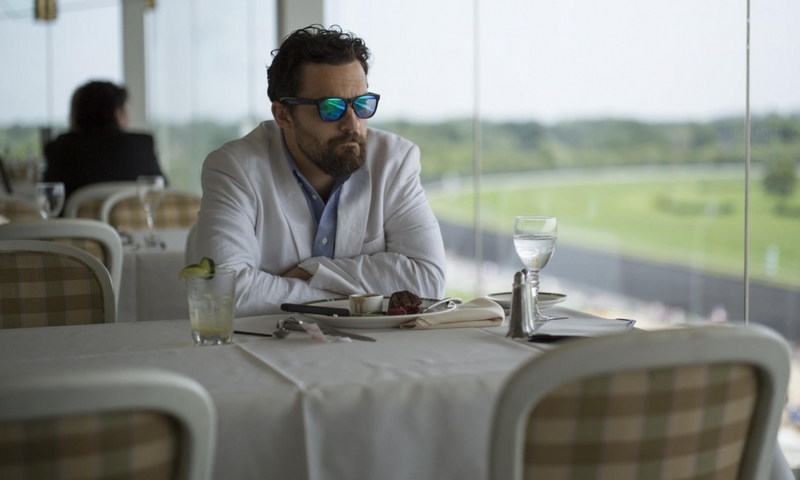 Jake Johnson plays Eddie Garrett, a small-time gambler who bets big only to lose huge. He plays the role of high roller as well as he can, but he's not bringing in lots of dough and that has the potential to blow up in face. In fact, it does. Garrett is asked by a low-level thug to look after some money while he's away in prison. At first, Garrett decides to just leave it be, but the guy will be gone a long time. Why not use that money to gamble and make some money on the side? Besides, even if he loses, he can just keep playing until he breaks even again. Nobody will ever know. Except he loses too much money too fast, and then's stuck. He needs cash fast, what will a guy who is known for losing do? Again, I am picturing "The Gambler." Sure there are some minor changes, but essentially both movies boil down to a up-and-down gambler needing quick cash to settle some kind of debt. Would you be surprised if the gambler in question has family issues? Would you be surprised if Jake Johnson's character meets a girl who forces him to ponder his existence and get out of the wheeling-and-dealing life for good? I get that maybe not lots of people saw "The Gambler," so maybe this works for you on a level where it does not for me. That's okay. I am just trying to explain why what could have been a fun experience ended up being dull for me. How does it work as a movie? Well, I will say for what its worth, the movie is well acted. Jake Johnson is an exciting supporting actor that is starting to feel the string of leading performances that have been good. He's got some tact as a performer and its starting to pay off. I can also say that the supporting work done by Keegan-Michael Key, Joe Lo Truglio and Aislinn Derbez is all quite strong. They definitely do the job they were hired to do and they are great. There is nothing wrong with the film performance wise. Its even quite funny and iconic at times, it just came off to me as "been there, done that." As far as Netflix Originals go, it maybe worth checking out.